N,N′-Diisopropylcarbodiimide (DIC) is a liquid carbodiimide used in peptide synthesis and contains the functional group RN=C=NR. Carbodiimides hydrolyze to form ureas, which makes them uncommon in nature. Between the different sources of carbodiimide coupling reagents in peptide synthesis, the use of DIC as a liquid carbodiimide is more convenient. 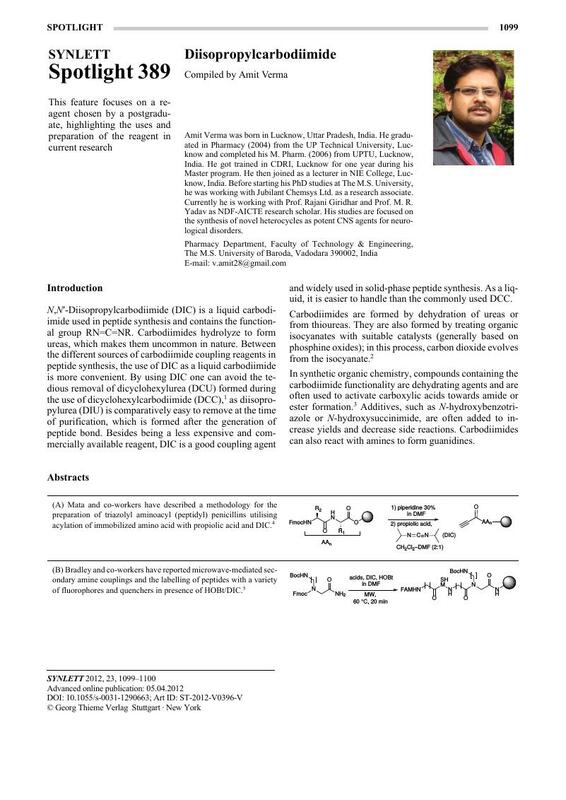 By using DIC one can avoid the tedious removal of dicyclohexylurea (DCU) formed during the use of dicyclohexylcarbodiimide (DCC),[ 1 ] as diisopropylurea (DIU) is comparatively easy to remove at the time of purification, which is formed after the generation of peptide bond. Besides being a less expensive and commercially available reagent, DIC is a good coupling agent and widely used in solid-phase peptide synthesis. As a liquid, it is easier to handle than the commonly used DCC.